Beauty Myth Debunking: Can Retinol Make You OD On Vitamin A? Everywhere you look, there's another skin cream containing retinol, the purest form of natural vitamin A. We're big fans of it over here in the beauty department, which is why, when we heard a rumor that you can be poisoned by using too much of it, our first reaction was "Jigga WHAT?!?" followed by some serious investigation. Before we get started, a quick note on what hypervitaminosis A could do to you: liver damage, blurred vision, hair loss, and a whole bunch of other Things You Do Not Want. It's not okay. So, it was time to ask some questions. One call to Dr. Jeannette Graf, M.D., assistant clinical professor of dermatology at The Mount Sinai Medical Center, provided the answer. Nope, it's not possible to get toxic quantities of vitamin A from your beauty products. Those rumors are "crazy," says Dr. Graf. "First of all, there's never been a case [of hypervitaminosis A] from someone using too much on their body. Retinol is the most naturally abundant form of vitamin A within the skin, so there's a natural limitation to how much you retain at any given point. If you become saturated, it just passes right through. It's certainly not being absorbed." 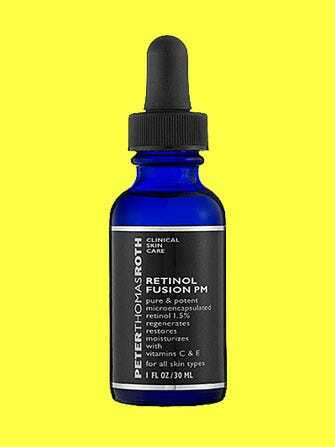 What about pro-retinol forms like beta-carotene? "It's completely harmless," assures Dr. Graf. "In fact, the body will only make vitamin A from a carotenoid (like beta-carotene) if it needs it. There's no danger of toxicity." Last item: Can any one product contain too much vitamin A? "Don't worry about how much retinol is in the products — it's not necessarily a sign of the efficacy of the product," Dr. Graf says. "The amount allowed isn't as important as the formula in which it's contained." So, again, don't stress. Dr. Graf advises using products with retinol at night for best results. "The skin is constantly regenerating itself, and it repairs on a DNA level in the evening, which makes the use of retinoids at night so helpful. It's the desert island ingredient most people should be using." In closing, rest easy: You can't OD on too much vitamin A from your skin-care products. Slather them on as directed and you'll A-okay.